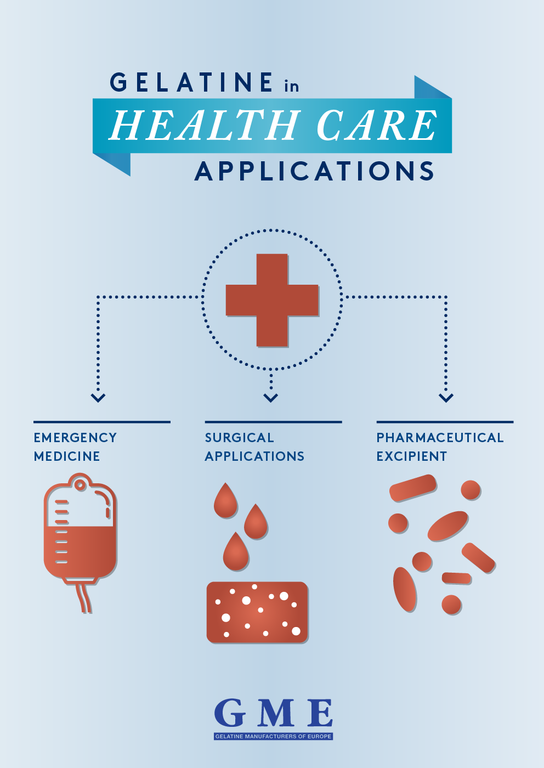 Gelatine has demonstrated its versatility in applications for the pharmaceutical industry and medicine – be it in the production of capsules or tablets or as a constituent of wound dressings, haemostatic sponges or blood volume substitutes. Gelatine is an important raw material for the production of hard and soft capsules as well as film-coated and effervescent tablets. Manufacturers make use of its unique adhesive, gelling and film-building properties. Orally administered medicines and dietary supplements in particular are protected by gelatine-containing capsules or tablets from light, moisture and oxygen and given a long shelf life. Consumers benefit by safe dosage and convenient ingestion because capsules and tablets coated with gelatine are easier to swallow. Also important is that gelatine has practically no allergenic potential and, as a natural product, is well tolerated. Hard capsules have already been manufactured in their characteristic cylindrical form since 1897. They are generally composed of up to 80 to 85 per cent gelatine and about 10 to 15 per cent water. Examples of further constituents are dyes. Hard capsules were traditionally used for powdery or granulated medicines. Thanks to modern production engineering, they can now, however, also be filled with liquid or paste-like formulations. Manufacturing involves a two-step process: first, two empty capsule halves, “body” and “cap”, are produced and put together. Then, they are reopened by the pharmaceutical manufacturer, filled with a substance and firmly sealed. Hard capsules are elastic and robust. The gelatine capsules provide effective protection against environmental influences such as oxygen or moisture, which could potentially reduce or change the effect of the active ingredients. The capsules only dissolve and release the active ingredients in the digestive tract. The thin gelatine coating facilitates oral administration and also masks the unpleasant flavour or smell of some constituents. 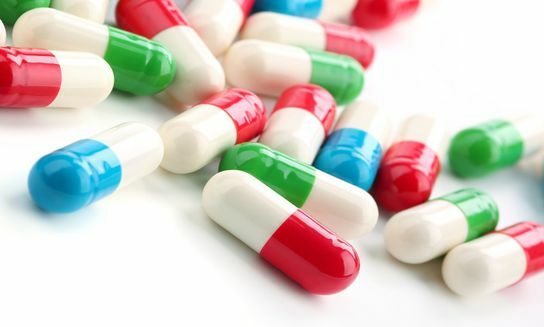 The capsules can be dyed either one or two colours using special dyes that have been approved for pharmaceutical applications, which not only helps the consumer differentiate between the various medicines offered in hard capsules, but can also help protect light-sensitive ingredients. Another advantage of hard capsules is that they give the ingredients in the desired formulation a long-lasting shelf life. This is of course also true for soft capsules. Almost 90 per cent of pharmaceutical gelatine is used for the production of hard and soft capsules. In contrast to hard capsules, the convex-shaped soft capsules are moulded in one piece and have thicker capsule walls. They are suppler and softer and are generally filled with active ingredients in the form of oils and pastes. The manufacture of these capsules and their filling takes place in a single production step. Similar to hard capsules, these gelatine capsules protect ingredients that are sensitive to light and oxygen-induced degradation, facilitate oral administration and mask unpleasant tastes or smells. Soft capsules make it possible for manufacturers to precisely dose liquid substances, such as oil-based vitamins. Using oil-based formulations also makes it possible to combine several active ingredients in one capsule. Similar to hard capsules, soft capsules are neutral in smell and taste and are easy to swallow thanks to their soft surface. Soft capsules can be manufactured in various shapes and colours and are also commonly used to divide cosmetic products into individual portions. For example, one application for soft capsules in the cosmetic industry is in the manufacture of bath bombs. Moreover, they are used for creams, salves or skin oils. Here, the soft capsule shell again protects ingredients that are sensitive to light and oxygen-induced degradation and makes it possible to develop forms of application perfectly tailored to meet manufacturer and consumer wishes. A gelatine coating can be applied to tablets by means of a dipping process. The gelatine coating of these so-called film-coated tablets make the tablets harder and more stable. Furthermore, film-coated tablets can be dyed or printed for better recognisability and are easier to swallow thanks to their smooth surface. Again, the coating offers protection from light and oxygen and masks potentially unpleasant tastes or smells. Variants of pharmaceutical gelatine as well as collagen peptide are also used as drying and binding agents in the manufacture of effervescent vitamin tablets and other water-soluble powders. Thus, for example, fine drops of oil-soluble vitamins can be integrated into an aqueous gelatine solution. Because the gelatine solution envelops the vitamins, it provides them with long-term protection from light, oxygen and moisture, which could otherwise change or weaken their effect. A powder is formed through special solidification and drying processes that can subsequently be dissolved in both warm as well as cold liquids. The powder can also be pressed into stable forms that are unaffected by storage, such as effervescent tablets. In emergency medicine, gelatine is used as a raw material for the manufacture of blood substitutes, such as plasma expanders. These increase the amount of fluid in circulation, preventing hypovolemic shock. As local haemostatic agents, gelatine sponges and films have long been used in the surgical field (for example in oral cavity and ophthalmological surgery, urology or gynaecology) and for the treatment of wounds in dental surgery. The structural composition of the gelatine sponges enables the absorption of large amounts of blood and makes it possible for new tissue to grow into the sponges. Since it only takes a few days for the body to completely resorb the sponges or films, they can be left in the wound without any negative effects. Gelatine used in pharmaceutical applications must meet additional requirements that have been defined in special regulations. These stipulate that pharmaceutical-grade gelatine must meet both the prevailing requirements for edible gelatine as well as the provisions for medicinal products. The European Pharmacopoeia lists further specific requirements for the manufacture of pharmaceutical-grade gelatine as well as for the physical, chemical and microbiological quality attributes of the finished product. Furthermore, gelatine intended for the pharmaceutical industry must undergo certification through the EDQM (European Directorate for the Quality of Medicines & HealthCare). Gelatine is used as a starting material for the production of blood substitutes such as plasma expanders. These are liquid pharmaceutical products containing gelatine and mineral salts. They help to stabilise the circulatory system in times of blood or plasma loss, as for example during an operation. Gelatine sponges and films have a long history in the surgical field. As local haemostatic agents, they enable the absorption of blood and also promote wound healing by allowing new tissue to grow into the gelatine product. In pharmaceutical technology gelatine acts as a binding agent in the wet granulation of powder blends or as a bulking agent for oily products. Hard and soft capsules are the most important areas of application.